Last weekend I made a trip north with Glenn Williams and Phil Rusch. 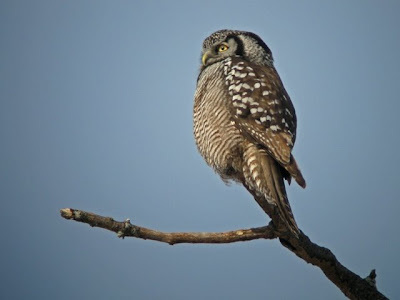 Our main target was the Northern Hawk-Owl that has been wintering in Center Harbor, NH. 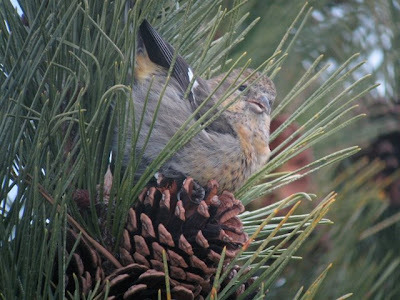 We pulled up to find the bird right along the road. 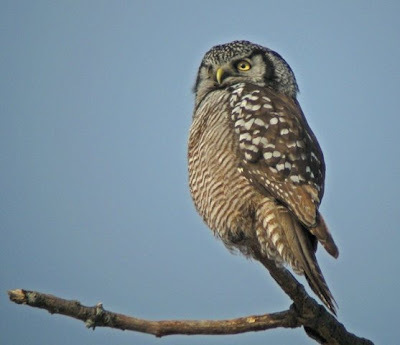 The owl flew from perch-to-perch and even chowed down on a juicy vole. 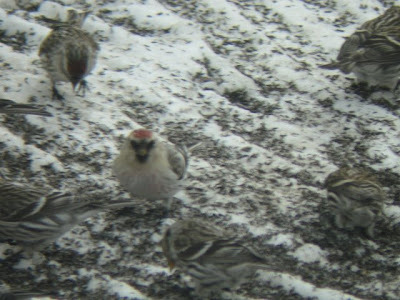 From there we headed to Tony Vazzano's house in nearby Sandwich where he had been visited by a large flock of redpolls that included 2-3 Hoaries. 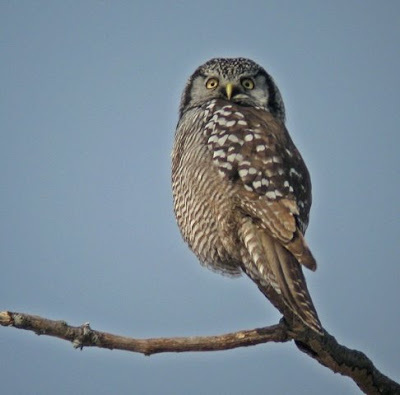 Tony invited us indoors where we were treated to nice views of at least 2 Hoaries through his living room windows. 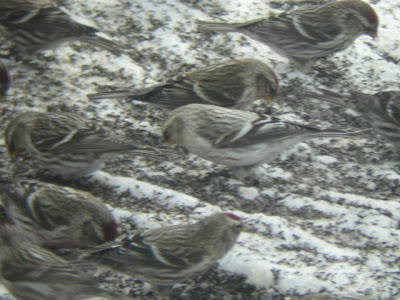 The flock also contained multiple rostrata (aka "Greater") Common Redpolls. 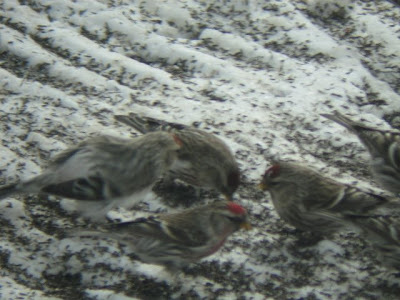 Three redpoll taxa in one shot. 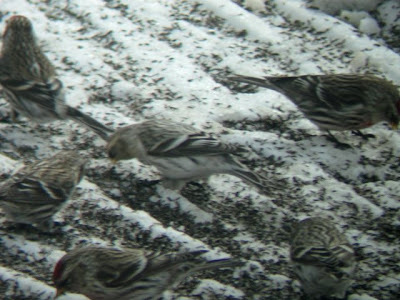 Note the exilipes Hoary Redpoll at center, and a rostrata Common Redpoll in the upper right. Head-on view of one of the Hoaries. 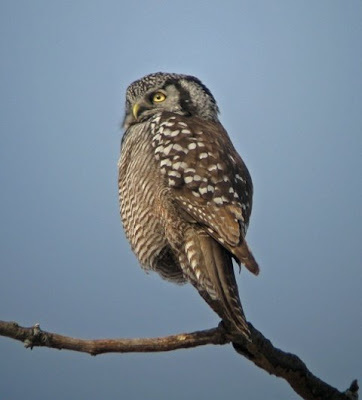 We took a detour on our way home by birding Salisbury and Plum Island, MA. 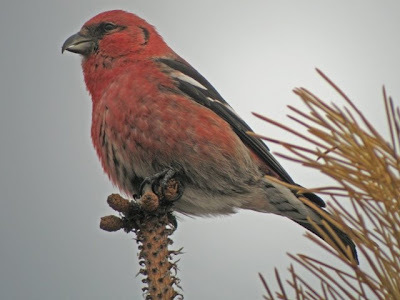 Salisbury treated us to great looks at over a dozen White-winged Crossbills, plus distant looks at a Snowy Owl. Newburyport Harbor held a first-winter Black-headed Gull and an adult Iceland Gull. 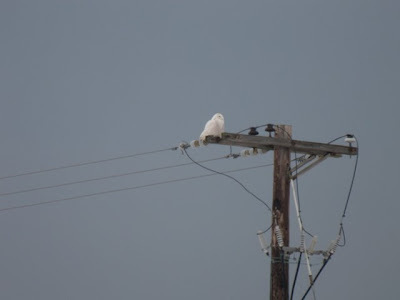 On Plum Island we were able to turn up two Northern Shrikes and two more Snowy Owls. 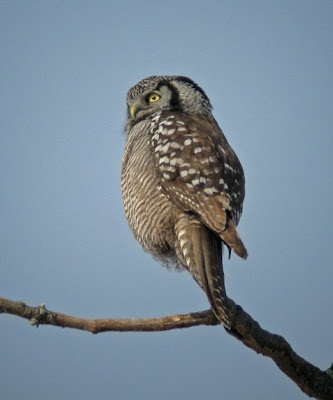 Overall it was a fantastic day of birding. 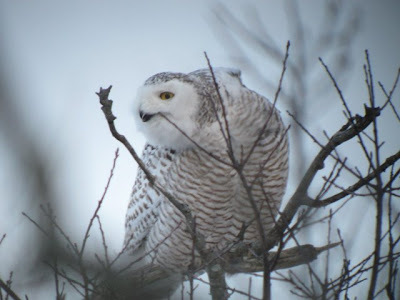 Every place we visited held great northern birds.